You might already know that stainless steel French Presses last the longest. They neither have a fragile glass carafe waiting to be broken, nor many plastic components that will distort. The Frieling French Press is one such model. But it stands out from the rest because none of its parts are made up of plastic. Not only is the body, but also the handle and the lid which are often plasticized boast polished 18/10 stainless steel. Internally, the stainless steel plunger mechanism ensure continuous operation. As a result, Frieling not only appear and feel strong, but also live well past your money’s worth. Once you grind your favourite coffee, fill it into Frieling, and allow it to steep for about 4 minutes - be rest assured that this machine is going to extract the optimum flavours hidden in your coffee beans. With the least amount of sediments at the bottom of your cup. In fact, you’ll be able to taste it until the last drop. However, make sure you don’t challenge it with finer grounds. The coarser they are, they more they’ll be filtered. The double-wall design was purposefully incorporated to seal off heat loss. If you brew iced coffee, it’ll keep the coffee cool 4 times longer than glass French Presses. The same can be said about pipping hot coffee. The thermal carafe will be able to maintain the heat of the coffee at least at a serving temperature for a couple of hours straight! Our advice is to drink it sooner than later. Or else, store it in a separate thermal flask to serve it later. This way, you’ll be able to preserve the taste before it turns bitter. That was a little bit of exaggeration, but close enough. Why we like the design so much is because it is sleek and won’t run out of style. Not every French Press has this effect, because over time, they tend to stick out like a sore thumb in your kitchen. Frieling has two design options available to choose from - the exterior mirror finish and the exterior brushed finish. The price between these choices doesn’t make a difference, so you can go for the one you find more appealing. But we personally think that the mirror finish would be ideal because it’ll keep shining even through pain. In other words: you can accidentally drop it or scrape it, and never see proof on its body. French Presses are often considered to be a bit troublesome to clean. They either end up with too many nooks and crannies or with tight-fitting parts that are too difficult to dissemble. But Frieling will prove otherwise. The plunger assembly is easy to dissemble and needs only a simple rinse under running water to feel new again. No time to wash it by hand? No problem, the entire French Press is dishwasher-safe. You can load it into the top drawer and have it cleaned. Using the dishwasher will not wear out Frieling. The mirror-finish will ensure it look brand-new for years to come. It resists rust and corrosion too - what more could you ever ask for! Looking for a French Press but lacking the patience to deal with a glass carafe? Then end your search with Frieling. It is not only suitable for indoor use, but also for outdoor. Specially campers and hikers would like it because the carafe preserves heat well. 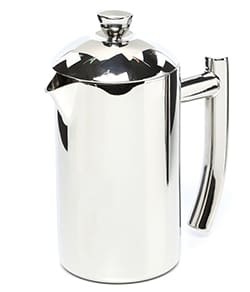 If you’re not willing to overlook the initial high-price of this incredible French Press for the long-term benefits, then look for a model like SterlingPro Double Wall Stainless Steel French Press. It is cost-effective and more efficient than the models at that price range. Frieling is an ideal choice for just about anyone on the market for a stainless steel French Press. Every inch of it is made with the intention to last long. In fact, it will in no time prove to be the best bang for your buck with the quality of brew, convenience and longevity.